Backslope Brewing is located in Columbia Falls, Montana off of U.S. Highway 2 on the way to Glacier National Park. They have several flagship beers that are all very good according to my palate, but their rotators are what I really enjoy. They also have great food such as rice bowls and sandwiches, plus, they have ample seating inside and even some covered seating, but open to the air, outside. 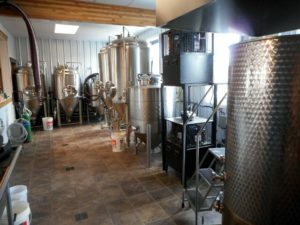 Backslope Brewing is not the first brewery to open in Columbia Falls, but it is currently the only one and it looks like it is there to stay. I say this even though they have not yet been open a full year, they will be officially opened for a full year March 9, 2017. I sat down with the owners Darin and Carla Fisher, Darin is the brewer and Carla the general manager, and I asked them questions about their brewery/restaurant business. From their answers I quickly gathered that they were business oriented people and that they run Backslope Brewing like a business and not just as a fun thing to do. They both said that they are after organic growth and that they do not want to force anything to the next level of growth before its time. Quite frankly, so many breweries and other businesses shoot for the moon without a well thought out plan and most of them fail miserably at least at first until they develop a sound plan. It is refreshing to hear a conservative approach to expansion but at the same time in a positive light with a true passion for what they do. From this I believe Backslope Brewing will do very well through the test of time. Backslope Brewing is currently a four barrel brewery that is slowly upgrading its equipment to a seven barrel system. They have already purchased some seven barrel fermenters and their mash tun and hot liquor tank are adequate for typical beers of 6 ABV at the capacity of seven barrels. For the big beers that Darin likes to brew like his Belgian style triples, quads and imperial IPAs he will make smaller batches. Making small batches of higher gravity beers is a fairly common scenario for breweries. While this means there is less volume of bigger beers, in reality they typically sell less volume of them anyway so it works out. I should note that there are other ways of making big beers with a small mash tun, but I will leave that for another story. For now, as a four barrel brewery, they can make all the imperial style beer they want. Besides, I suspect that if patrons like me buy more volume of high gravity beers than is expected, they can always upgrade their mash tun. As with many craft breweries, some of the equipment is repurposed dairy equipment like their mash tun and hot liquor tank and much of it has been purchased from other breweries. Backslope Brewing has even loaned some of their equipment out to another local brewery while it was still in the building phase. They have also sold some of their old equipment to another local brewery that will be opening up in the near future. I will have another article soon explaining the story of the equipment and how it has aided in the support of getting other breweries on their feet or up to capacity. So how does a brewer come up with his or her recipes? Darin stated that when he creates a new beer it starts out with what he wants to taste. He might get inspired by another brewer’s beer, but he always puts his twist on it based on what he imagines the flavor should be. As for beers, Backslope’s best sellers are Crooked Wind IPA during the winter and The Pilgrim Blonde during the summer time. They have eight tap handles, four of which pull their flagship beers and the other four of which pour their rotators. On the restaurant side they have weekly specials so you have to check in to see what is new but they also have many mainstay dishes to include small plates of things like fried pickles. 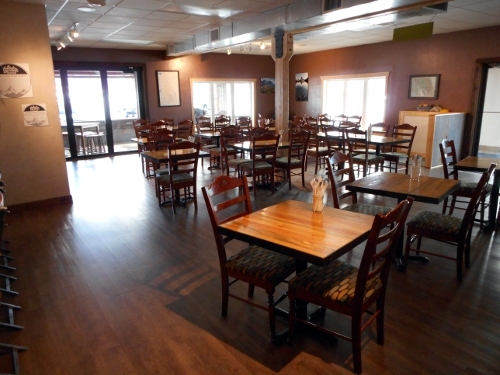 To be able to offer excellent food, Backslope Brewing asked Jake and Becky Sorensen of the Palette Café, who were looking for a bigger venue at the time, to be a part of their team and they agreed. According to Darin and Carla, it has been a great relationship. I asked if food were important to beer sales and the answer was, food is important to our business model and to the community. People come in for food at lunchtime and sometimes they drink a beer even though they really came in for the food. Food is important in the overall picture because, as Carla put it, “people gather around food”. I should point out that when I and my friends go there, it is initially for the beer but, we do usually buy food to go with our beer. I asked them why they started a brewery in Columbia Falls, Montana and I was told by Darin and Carla, almost in unison, “This is our town. This is where we want to be”. They also said that the local community has been very responsive and supportive. They do have their regulars whom they see almost daily and some whom they do not see as often, but they also have a good number of new patrons especially during tourist season. Even on a nice February day when I was there shortly after the opening time of 11:00 AM, the patrons were filing in for lunch and some even for a beer. At the end of the interview Darin gave me an in-depth tour of the whole building. Given that I had toured the building many years ago when it was about to open as a pawn shop, I was quite shocked with the transformation it had undergone to become a brewery, taproom and restaurant. To the owner of the building who made it happen, I say well done. The whole building has a nice warm feeling with lots of wood and earth tones. Darin and his crew have done some fine work. Specifically, in the brewing area which is visible to the public through windows in the taproom/restaurant area you will find a well drained tile floor with lots of nice stainless steel vessels standing tall and some of them perking away. 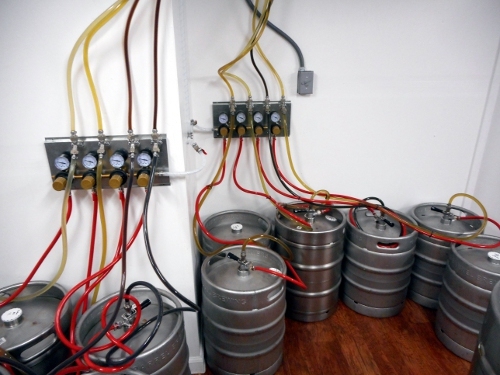 In the walk-in cold room where the serving kegs are stored each keg currently on tap has its own regulator so that Darin can maintain the proper volume of CO2 for each keg and serve it correctly. I already knew that Darin brewed beer to my palate’s liking so I purposely brought a growler with me to be filled after the interview. My plan was to go with their Crooked Wind IPA, but after trying samples of the rotator beers I went with their “Velocity” Belgium style triple, which I found to be excellent. I am sure I will be going back to try some more of Backslope Brewing’s beer in the near future. If you wish to find out more about Backslope Brewing visit their website at: http://www.backslopebrewing.com/ or better yet, stop in the next time you are in Columbia Falls. ← Have we really ruined our senses with over hopping? Chris, Sandy and I truly enjoyed your article on Backslope Brewing. It is well written and very informative. Keep up the good work. A very nice write-up of a very awesome place ran by some of the best people you’ll ever meet.